Steve and I hosted a coffee lecture for fellow Cornell Alumni. 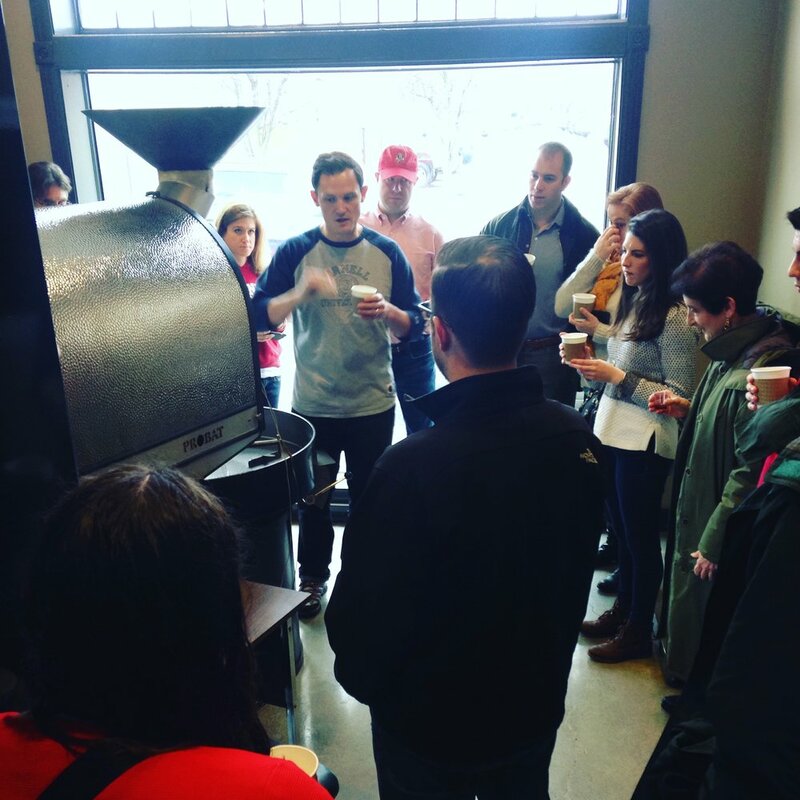 Why are we switching roasters? 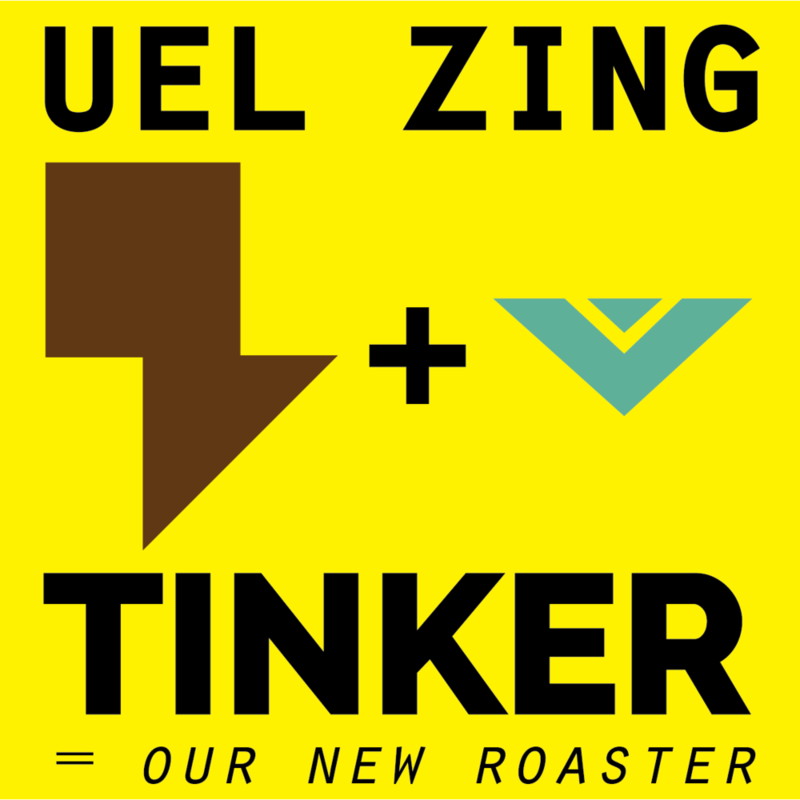 Tinker Coffee Co. and Uel Zing Coffee align in many ways: from our approach to coffee and consumer education, to our branding and entrepreneurial energy—it just makes sense. As a young coffee start-up, much like Uel Zing, Tinker has always taken a "third wave" approach to coffee i.e. transparent and sustainable sourcing, consumer education, and bringing the coffee to life through precisely developed lighter roasts of single-origin specialty-grade coffees. Our signature ZING blend of three different origins will be roasted to a new level of artistry and science. Tinker? Yeah, Tinker. Tinker roasts awesome coffee. Tinker promotes transparency and education through cupping classes. Tinker expands their brand through partnerships and social media. Tinker connects us to the city of Indianapolis. And we'll benefit Tinker likewise in Bloomington: through cuppings and tastings, social media, and brewing their coffee everywhere we can. We are both young companies actively growing and we will certainly grow together. Since we made the decision to work with Tinker, there have been all sorts of logistics to figure out, from labels and co-branding, to pricing and scheduling. They're even helping us out with a brand new Mahlkonig VTA 6 grinder! We began by roasting and cupping several different coffees that Tinker was excited about; we were open to tweaking the blend. Maybe a Mexican or Brazilian coffee would replace the Nicaraguan, maybe their new Colombian could cover the bass note of the Sumatran. We cupped several sessions with Tinker—hot brewing—then took more beans back to the Lab to blend in various ratios and cold brew. We cold brewed test batches in jars—at the same 1:6 ratio. Diego Chavarria's operation in Nicaragua. Video from another roaster who visited the farm. We were feeling more and more like our original blend was the way to go; if it ain't broke, don't fix it. So we decided to go with the exact same chocolatey Nicaraguan bean from the exact same farmer: Diego Chavarria in the Matagalpa region. In South Bend, Indiana, an importer named Theta Ridge buys directly from Diego and his family—so it's more or less "direct trade" from Diego to Theta Ridge to Tinker. Importers handle the actual shipping logistics of moving large amounts of coffee across the world, amounts larger than the average roaster could handle on their own. Here's Chris smelling another round of cold brew samples. As for the other beans, Tinker had an Ethiopian Sidamo that blasted blueberries in our face, so that was an easy choice. Sidamo is a region in Ethiopia known for very fruity coffees, and this dry-process coffee comes from the Wottona Bultuma Co-op through Sustainable Harvest importers. The Sumatran, like the Nicaraguan, Tinker ordered just for us. Sumatran coffees are known for being very earthy and smoky—the kind of bean to fill your dark roast craving. Ours is grown in northern Sumatra, semi-washed/wet-hulled, imported by Red Goni. We cupped several different coffees before arriving back at the original ZING blend, which was originally based on the Leftist Blend by Gimme! Coffee—where I first got into coffee, in Ithaca, NY. How did we come up with our ZING blend in the first place? Our blend is based on the Leftist Espresso Blend around 2011 of my coffee alma mater, Gimme! Coffee in Ithaca and NYC, NY: 25% something light and sweet, 50% nutty/chocolatey, 25% smoky bass note. Our blend now is 35% berry-sweet Ethiopian beans, 45% chocolatey Nicaraguan, 20% smoky Sumatran. Basically, we just ramped up the Ethiopian for a little more sweetness. We've happily cold brewed our ZING blend roasted by Quarrymen Coffee Roasting Co. here in Bloomington since the very beginning. I spoke with two or three nice roasters in town before landing with Quarrymen. They were a slightly smaller operation so they had more time to spend with me, and I just hit it off with Mr. Quarrymen, Wes Burton. He and his wife Debi roast on an electric fluid bed air roaster... that he designed and built from scratch! Over hours and hours of conversations about coffee, whiskey, whisky, limestone, DIY-ing, you name it, Wes has become one of my best friends in Bloomington. While I originally leaned toward choosing a more trendy single-origin coffee, Wes convinced me that a blend would hold up over time—much more complex, not a 'one trick pony'—and I've been very happy with the blend ever since. He and I worked together to develop the ZING blend when we first started in 2013. Working off of the Gimme! Coffee formula mentioned above, we experimented with the beans he already had—it was Wes who introduced me to Diego Chavarria's Nicaraguan coffee, the main component of our blend and the only one that carries on in the new blend. It is bittersweet to leave Quarrymen, but we are ready for a new chapter. I met Steve of Tinker in July of 2014 through my collegiate alma mater, Cornell University. Steve was "the organizer of the Cornell Club here in Indy and as luck would have it, [I] also happen to be a coffee enthusiast." Turned out he and his brother-in-law, Jeff Johnson, were just starting their own coffee biz... and we soon met for coffee. We've since taught several coffee classes together, sold their beans as our very first Rotating Roaster, and said hello whenever we're in Indy. And now, we'll see them a whole lot more—every Wednesday to be exact… to pick up our freshly roasted ZING blend! Steve and Jeff, I think this is the beginning of a beautiful friendship.